This is the popular dim sum appetizer, with a shrimp mixture spread on slices of toast and deep-fried. To add something extra to the taste and appearance, feel free to use a good crusty bread such as a French baguette. The lard is optional, but it will add a light airy texture to the shrimp when deep-fried. Uncomfortable with deep-frying? I’ve included instructions for baking the shrimp toast. Makes about 20 servings of Shrimp Toast. Preheat the oven to 225 degrees Fahrenheit (107.2 degrees Celsius). If the shrimp are frozen, cover them in a bowl of cold water for 30 minutes or until thawed. Drain the shrimp and pat dry with paper towels. Remove the tails from the shrimp if needed. Trim the crusts from the bread. Cut each slice of bread diagonally to form 4 triangles or cut each slice into 4 equal squares. Place the bread on a 9 X 13 non-stick baking sheet. Bake at 225 degrees for 30 minutes or until the bread is completely dry. (Drying the bread before cooking ensures that oil won’t seep into the bread). While the bread is drying, prepare the other ingredients. In a food processor with a knife blade attached, finely chop the shrimp with the lard. Add the water chestnut, then add the tomato, green onion, and ginger. Add the rice wine dry sherry, or rice vinegar, beaten egg, salt, pepper, and cornstarch. Process until the mixture has almost a paste like texture. Begin heating the oil for deep-frying. Carefully spread approximately 2 teaspoons of the shrimp paste over the top of each piece of toast. To deep-fry the shrimp toast: Heat oil in a wok or other deep-frying utensil to 350 degrees Fahrenheit (approximately 175 degrees Celsius). To test the oil, drop a small piece of dried bread into the oil – it should rise up and start bubbling. Carefully add 1 or 2 pieces of shrimp toast into the oil, shrimp side down. The bread should float on top of the oil and begin bubbling immediately. Cook for about 1 1/2 minutes, then turn over and cook for about 15 more seconds. Remove the shrimp toast with a slotted toast and drain on paper towels. To bake the shrimp toast (not really suitable as an appetizer but okay for the family on nights you don't feel like deep-frying): Increase the oven heat to 375 degrees Fahrenheit (190.5 degrees Celsius). Bake the shrimp toast for 15 minutes, or until the shrimp is cooked. 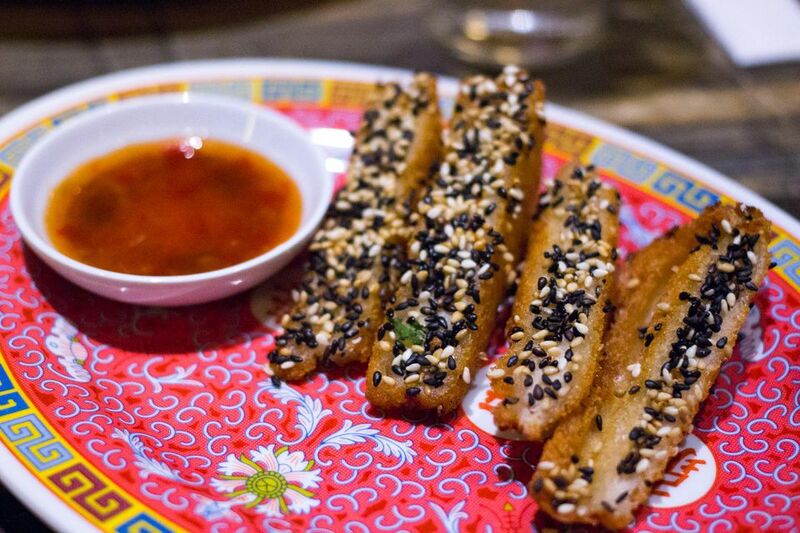 Serve the shrimp toast warm. (Shrimp toast can be prepared ahead of time up to the cooking stage and frozen). How Do You Make Shrimp Stir Fry With Chinese Greens?